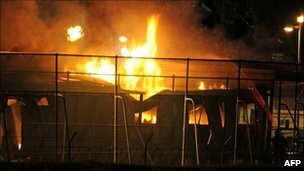 “By 8.30pm Wednesday night, there were fifteen asylum seekers on the roof in Villawood detention centre, Sydney, Australia. There are asylum seekers from Iran, Iraq, Afghanistan and Pakistan”. A large number of tiles were torn from the roof and thrown into the grounds of stage 3 section of the detention centre. By Thursday Morning Detainees had burnt down nine buildings. Riot police had to be called in to end the disturbance after the centre’s guards retreated. Two Kurdish asylum seekers, Mehdi, aged 24 and Amir, 22, began a roof top protest in the early hours of Wednesday 20 April. The asylum seekers, who have been in detention for 15 months, have also begun a hunger strike. The two asylum seekers have been rejected at the appeal stage of the determination process and say they do not know what will happen to them now. “We need an answer, we don’t know what will happen to us,” one of the protesters told the Refugee Action Coalition. They say they will stay on the roof until they have an answer about what will happen to their cases. The Kurdish asylum seekers are like hundreds of others in detention with no information about their right to appeal for judicial review to the Federal Magistrates Court. There is no information in their language and no arrangements in place for them to make their applications or get legal representation. A governmental review was meant to make recommendations by the end of March, but so far nothing is in place and the number of cases is growing by the day. “There is a crisis of legal representation inside the detention centres. Hundreds of asylum seekers are being affected in the same way, but have no information about what they can do. They should know their rights and be able to access lawyers, the courts and advocates. It is a disgrace that thy are being left in limbo, ” said Ian Rintoul, from the Refugee Action Coalition. A convergence of refugee supporters on Curtin detention centre over the Easter weekend will focus on this issue along with the questions of long delays for ASIO security clearances and long term detention that is holding refugees in detention for over 18 months. “We hope to able to explain to asylum seekers that they have a right to appeal and to explain how they can make applications to the court. But in some remote centre like Scherger and Curtin asylum seekers have problems even receiving and sending faxes,” said Ian Rintoul. Protests are also planned at Villawood (meeting Chester Hill 12 noon to march to the detention centre) and Maribynong on Easter Monday.